On our trip to the Fells Point Farmers Market we picked up a Spaghetti Squash. While the markets are filled with all different kinds of squashes and gourds at this time of year, there is something so fascinating about the spaghetti squash. I thought if nothing else the kids would like how the squash magically turns into spaghetti and maybe think it was cool enough to actually eat. We started by preheating the oven to 350 degrees. I then sliced the squash in half lengthwise, a task easier said then done, but once I found the right heavy duty knife it went okay. The Bee then helped me scoop the seeds out of the center. Which was kind of fun and a good preparation for carving pumpkins. I then drizzled the inside of the squash with a little olive oil and a sprinkle of salt and pepper, before placing the squash face down on the baking pan. 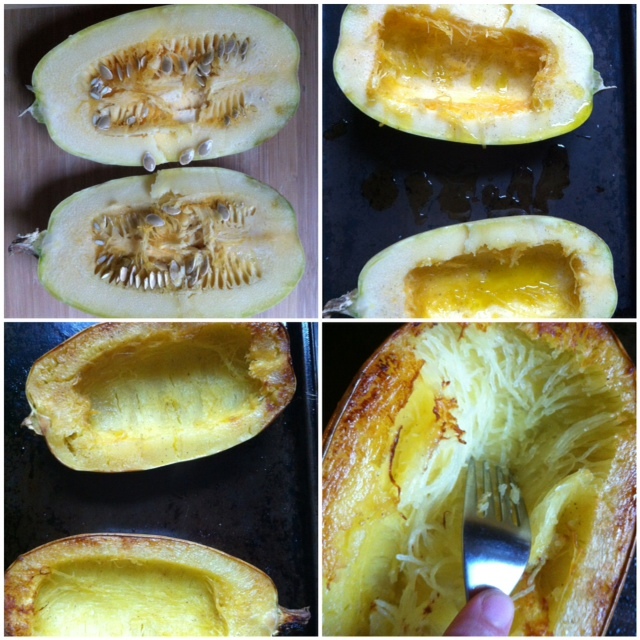 I slipped the pan into the oven and baked for 30-45 minutes, until the squash was fork tender and starting to brown. Then the fun part, I took a fork and scraped the inside of the squash to form thin little "spaghetti" like noodles. The Bee was amazed and I have to admit I was too. Even though I have made this before, the fact that this squash forms these perfect little noodles is pretty cool. Once we had made all the "noodles" we mixed them in a bowl with a little more olive oil, Parmesan cheese and garlic. Both the Bee and Bean ate some, which I will count as a success these days, since they both seem to be in a little bit of an anti-eating phase. I am thinking next time I might try to top the squash with tomato sauce and see what happens. 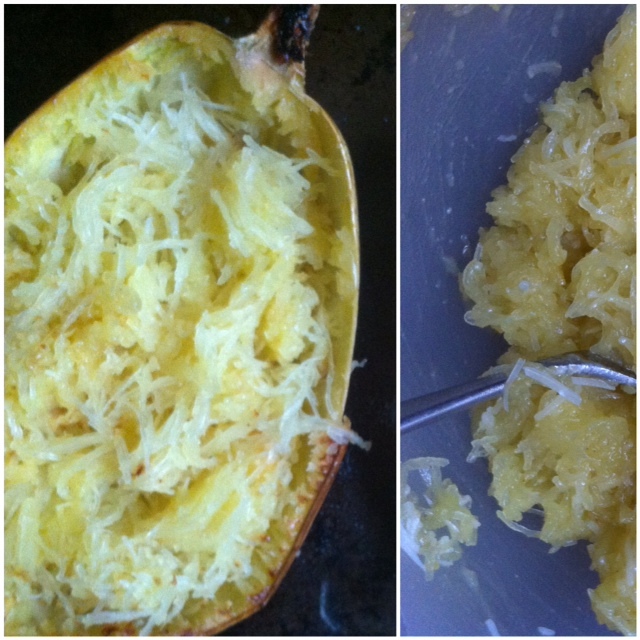 Does anyone else have a favorite spaghetti squash recipe?